Cork is environmentally friendly, renewable resource and have been using for different purposes many centuries. With discovering of agglomerated cork in 19th century it makes possible to produce cork in sheets what allows to use cork for insulation and flooring purposes. 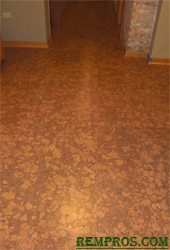 After that cork floor became a very popular product for installation in residential and commercial buildings. Cork floor is made from the crust of cork oak trees gathered every nine – twelve years during early May to the late August. The harvesting should be made in this period of the year because the bark can be peeled without harming the tree. Generally, first harvest can be made from the tree which at least 25 years old. After harvesting process the bark is shredded and mixed with some other components to get a hard but flexible flooring material. In addition, some cork flooring, known as mosaic cork, made through recycling process from wine bottle industry wastes. Most of the cork oak trees population concentrates in Mediterranean countries – such as Spain, Algeria, Morocco, France, Italy and the biggest producer of cork – Portuguese. In the 1920th cork oak became protected by the law and it become illegal to cut healthy trees for any purpose. Nowadays a lot of manufacturers produce cork flooring throughout the world, but raw materials still mainly coming from the Mediterranean countries. There are cork oak trees grow on North America continent, but they are not in use for any major manufacturing purposes. As a renewable resource with its natural beauty and appearance cork is the one of the best flooring option for an environmentally friendly home design. Its softness and durability makes the floor comfortable to walk on and lasts for many years. Wide variety with easy installation process makes the cork flooring competitive with other flooring materials such as hardwood or laminate. Cork floor has great insulation properties and helps reduce noise unlike any other flooring. It is nontoxic, antimicrobial, and great anti-allergenic material what makes it suitable for any room. Cork floor is easy to clean and maintain. Even though manufacturers adding some components to preserve desire color of cork floor it has an ability to fade due to its natural properties. Some hard impacts can leave a scratches or dents on its surface. Also if protective surface sealer will be wear out and cork floor won't be resealed it will easily absorb stain. Average cork floor is insignificantly less expensive than average domestic prefinished hardwood flooring and slightly more expensive than laminate.